The Association of Personal Injury Lawyers (APIL) are a not for profit organisation whose sole purpose is fighting for the rights of injured persons. They were established over 25 years ago and over time have grown to become one of the most respected organisations in the personal injury field, and they constantly strive to promote and develop expertise in the practise of personal injury law, for the benefit of injured people. 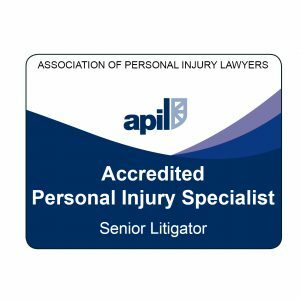 By being accredited by APIL a solicitor has demonstrated a dedication to the rights of the clients, as well competence in the field of personal injury. The standards of APIL are extremely stringent, and to become APIL accredited is extremely challenging. At Liddy’s Solicitors the founding partner, Kevin Liddy, holds an accreditation from APIL. Kevin originally qualified in 1993 and specialises in personal injury and clinical negligence. Throughout his very successful career he has proven time and time again his dedication to the client by putting client services above all things. To find out more about Liddy’s personal injury or clinical negligence services just call our Wakefield office on 01924 780 753, our Barnsley office on 01226 731 314 or contact us here. To find out more about the APIL accreditation just click the logo below.